It’s time to be confused! Modes are talked about quite a bit, but no one seems to know much about how they work or fit into music, let alone how they work on the ukulele. A mode is a major scale that starts and stops on a certain note in the scale. Or they can be derived from a formula, but that takes longer to figure out. The most confusing thing about modes is the fact that they are found and explained as part of a certain scale, but called by their own name. It’s the same thing, but with two ways to identify it. *Formulas are built from a major scale. All examples in this lesson use the C scale. The same applies for any scale you wish to use. You would just play in the root scale (C major). At lot of the music that is normally played on ukulele is in this mode. Examples are all around of how the chords and note interact. You don’t need to alter any chords in this case if you are playing in C Ionian. Now, because we’ve moved to “mode land” this becomes D dorian instead of “C starting on the 2nd note”. …And the key was D, you would use a C scale for a solo, but emphasize the dorian sound by starting and stopping on D or other current-chord-notes. But you ARE playing D dorian. Dorian is a minor sounding mode with one note that has an interesting “edge” to it. It’s almost a normal minor scale, but the 6th note is sharped (moved up one fret). The minor with a sharp 6 is the dorian sound. The sharped 6th means that all chords in the key that use a 6 now have that note sharped. Instead of building your chords around the normal scale, you build them from the mode. “Oye Como Va” by Santana. That song is in A dorian. So that changes the normal Dm that is found in the key of A minor to a D major in A dorian. The chord progression for that song is: Am D.
That is an E phrygian scale (not “C started and stopped on the 3rd note”). Phrygian has a minor, almost Middle-Eastern sound. Because of that you can use it to really emphasize an exotic feel. Tons of songs. “Eleanor Rigby” by The Beatles, “Could You Be Loved” by Bob Marley, “Sultans of Swing” by the Dire Straits, “All Along the Watchtower” by Dylan and Hendrix. [Stumped] A lot of metal music use locrian but besides little stints in and out of it, there aren’t any songs that would be considered popular that use locrian. 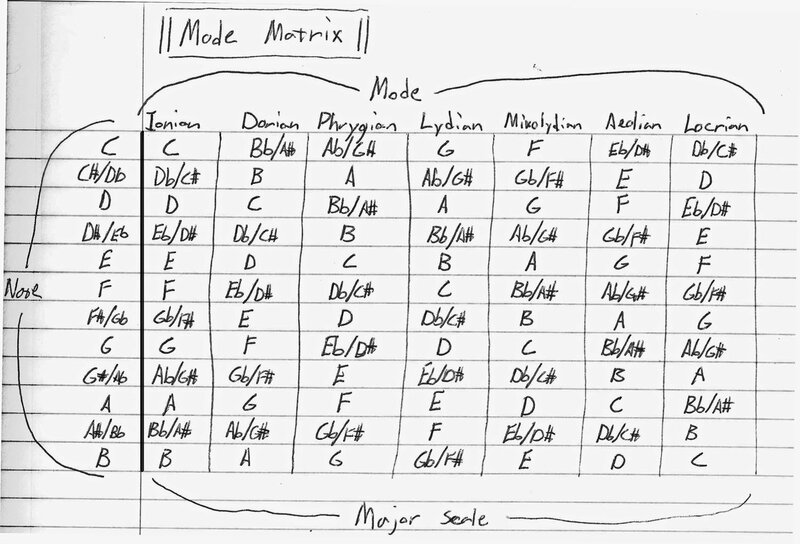 Here is a matrix I wrote out that shows how the modes are related to a certain note. It’s not very pretty but it would take much longer for me to do the same thing in “Paint”. The left column shows the root, or the note-name of the mode you’re looking for. Across the top are all of the modes. Below them, are the major scales you would play to match up the mode to the note. This goes back to the concept of “starting and stopping on”. The name of the mode you are looking for is the note you start and stop on and the note in the mode column is the major scale you would use. For example, if you want to find out what notes are in D mixolydian, find the D note in the left column then trace its row across to the mixolydian column and where the two bisect is the major scale that has the right notes: G. So you would use the notes of a G major scale started and stopped on D for D mixolydian.